Numerous types of tyres are used for winter driving, each with varying, and often misunderstood, levels of safety and performance. This page takes you through all you need to know about driving this winter. 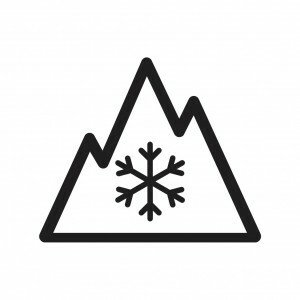 Winter or snow tyres that receive the official snowflake marking, also known as the 3PMSF ‘3 Peak Mountain Snow Flake’ symbol, provide verified safety for demanding snow conditions. The definition of a winter tyre is stated in the European ECE regulation 117.02. It states that the tyre’s tread pattern, tread material or structure must be primarily designed in order to provide better characteristics than ordinary tyres in terms of acceleration, traction and stopping under demanding winter conditions, and that it must be verified. The 3PMSF symbol is standardised and controlled by EU authorities, guaranteeing that the product meets the conditions of rigorous testing and is suitable for operation in difficult weather conditions. 3PMSF marked tyres have been approved through regulation tests to guarantee a higher level of performance under winter conditions stated in the European ECE regulation 117.02. 3PMSF winter tyres are designed to stay flexible in temperatures below 7°C and provide excellent grip on snow, slush, wet roads and bare asphalt. The aggressive tread design and siping provides grip and stability in snow and will disperse away water and wet snow slush. Compared to M+S tyres, 3PMSF winter tyres offer superior braking and cornering performance on wet and rough ice, soft and hard-packed snow, and slush. A tyre without the 3MPSF marking cannot be marketed as a snow tyre or a winter tyre. The M+S symbol on tyres is very misleading. It’s a declaration from the tyre manufacturer that the product can operate in mud and snow better than their regular models. However, there is no performance standard or traction/stopping tests to pass as the M+S designation refers only to the tread pattern. You will find the M+S symbol on off-road, All-Terrain (AT) tyres and on many ‘summer’ all season tyres. Even some high speed rated (Y) summer tyres may have this designation. It says nothing about the tyres rubber compound and how it will perform on snow, slush and ice. Tyres with M+S marking are not associated with any mandatory performance test and there is no performance guarantee associated with M+S marked tyres. The M+S marking are based on a tyre’s geometry and not how well it does on tests actually driving in mud or snow. 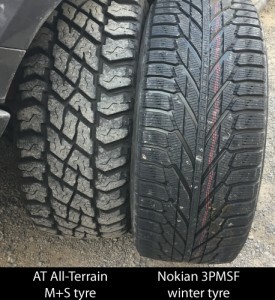 Tyres marketed as AT Tyres (All-Terrain/Mud-Terrain/Off Road) are not winter tyres even though some may display the 3PMSF symbol. An AT tyre complying with the FMVSS 139 requirements (1 test method) do not comply with the UNECE R117 (3 test methods) because these regulations have a totally different set of characteristics. This is easy to understand as AT tyres have little, or no, siping. Sipings are the thin slits across a tread surface, that improve traction in snow and icy conditions. An icy road surface is not always the cause of the problems on alpine roads, deep wet snow slush can easily turn a driver into a passenger. On a wet country road hydroplaning or aquaplaning is dangerous. However slush planing, that can occur when driving on wet soft snow on alpine roads, is even more dangerous. When slush planing occurs you cannot steer, or brake, the vehicle because the tyre loses contact with the road even at very low speed. The combination of deep slushy melting snow, a layer of water on the road surface, and possibly ice can make driving extremely dangerous, even for the most experienced driver. Slush has a higher viscosity than water, therefore is pastier, and cannot flow through the tyre tread channels as easily as water. The tread pattern of an M+S tyre will not disperse this wet snow slush from underneath the tyre. The contact between the tyre and the road will be lost, and so will the grip. How do you prevent slush planing and aquaplaning? As this video illustrates, to effectively prevent slush planing and aquaplaning Nokian winter tyres feature polished grooves which allows slush and water to flow easily and efficiently through the main grooves to the side. Snow chains are designed to allow a vehicle to climb a gradient that is beyond the grip level of the tyres. State regulations require all vehicles in Victoria, and 2WDs in NSW, to carry wheel chains that can be correctly fitted to your tyres when required. The Owners Manual of your vehicle will detail what wheel and tyre combinations are approved for the fitting of wheel chains. In order for wheel chains to work effectively they must penetrate into the compacted snow surface to provide the maximum amount of traction. Traction may be lost and wheel spin experienced when the snow and/or ice begins to break up and melts to slush – this is what causes chain wear. In these situations the vehicle can slide on the wheel chains. Here is a safe way to determine how much tyre grip is available for any vehicle when driving in challenging winter conditions. When it is safe to do so, at a safe speed, and, making sure that no one is close behind you, apply the brakes firmly until the wheels lock up and the ABS is activated. Keep the brake pedal pressed down until the vehicle stops completely. This will give you a clear indication of the grip available at that particular point in time. You can repeat this test to continually monitor grip in different conditions. This simple test procedure will indicate the grip level of your tyres and highlight the need for correct 3PMSF winter tyres for safer winter driving. For more information see our checking your winter grip page. Any forthcoming regulation changes are likely to include a requirement that snow chains comply with the European ON-V5117 standard and snow/winter tyres be identified with the 3PMSF symbol as per the ECE 117.02 snow test. Tyres with M+S marking are not associated to any mandatory traction test and there is no performance guarantee associated with M+S marked tyres. In Germany the old rules have been tightened and the M+S logo no longer suffices. Only tyres with the Snowflake logo (3PMSF) comply with their new regulations. Motorists in Germany have a legal obligation to fit 3PMSF winter tyres on their vehicles during winter. What about the current regulations? For details of current regulations for Australian alpine areas please see our Australian regulations page. We encourage you to explore our site further, starting with our homepage, as well as our Safety and Learn sections and the cost benefits of snow tyres. Please contact us regarding tyre sizes, load and speed ratings, availability or pricing of Nokian tyres for your vehicle.